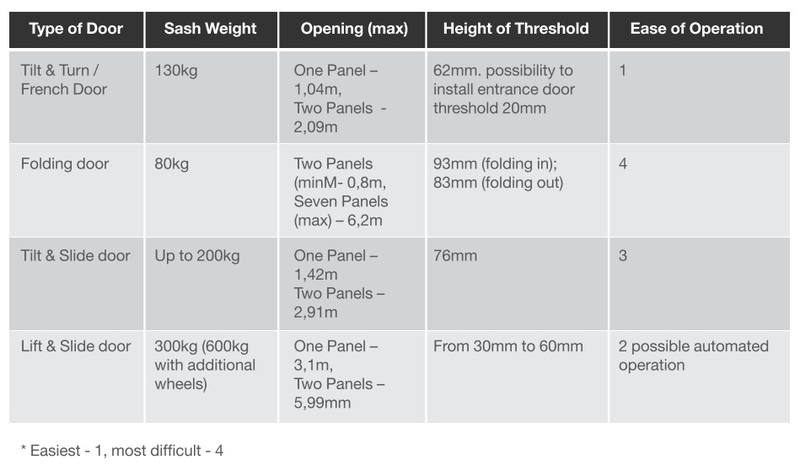 Home » News » How to choose the right doors? How to choose the right doors? Who will operate the doors? Will children be opening them? Is there a need to lock the doors from the outside? Will there be a lot of movement? Maybe there is a need for disabled access? Are there any special safety or acoustics requirements? Bigger maximum sash weight allows heavier glass units to be installed, this increases the sound insulation and safety of the doors. When the inside space is limited and there is no possibility to use tilt & turn or folding doors we suggest tilt & slide or lift & slide doors, where the sashes slide in front of a ﬁxed glass panel and stack perfectly within the door frame, providing a seamless transition from outside to inside.